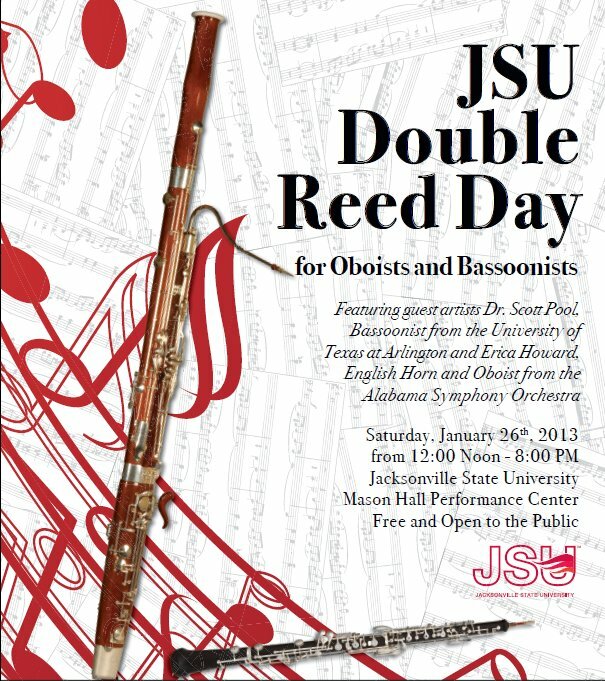 Students of all Levels, Directors, and Professionals are invited to Jacksonville State University Double Reed Day, Saturday, January 26, 2013. THIS EVENT IS FREE AND OPEN TO THE PUBLIC! The day will be filled with opportunities to hear great music and receive advice from our Guest Artists Dr. Scott Pool, Professor from the University of Texas at Arlington on Bassoon and Erica Howard performer affiliated with the Alabama Symphony Orchestra and Atlanta Ballet on Oboe and English Horn. If you would like to register as a performer for the masterclass, please contact Eryn Oft at (256) 782-5046 or eoft@jsu.edu. Spots are limited so sign up early!